Women of Fortune tells the compelling story of mercantile wealth, arranged marriages, and merchant heiresses who asserted their rights despite loss, imprisonment, and murder. Following three generations of the Bennet and Morewood families, who made their fortune in Crown finance, the East Indies, the Americas, and moneylending, Linda Levy Peck explores the changing society, economy, and culture of early modern England. The heiresses - curious, intrepid, entrepreneurial, scholarly - married into the aristocracy, fought for their property, and wrote philosophy. One spent years on the Grand Tour. Her life in Europe, despite the outbreak of war, is vividly documented. Another's husband went to debtors' prison. She recovered the fortune and bought shares. Husbands, sons, and contemporaries challenged their independence legally, financially, even violently, but new forms of wealth, education, and the law enabled these heiresses to insist on their own agency, create their own identities, and provide examples for later generations. List of figures; Acknowledgments; List of abbreviations; Family trees; Introduction; Part I. Money: 1. 'The Great Man of Buckinghamshire' The Lord Mayor, the Benefactor, and the moneylender: the Bennets; 2. 'My personal estate which God of his infinite goodness hath lent me' the grocer's apprentice: the Morewoods; Part II. Marriage: 3. 'The £30,000 widow' and Kensington House: the Finches, the Cliftons, and the Conways; 4. 'I was never one of fortune's darlings' city and country: the Gresleys; 5. 'One of the greatest fortunes in England' money, marriage and mobility: the Bennet heiresses; Part III. Murder: 6. “The most sordid person that ever lived' the murder of Grace Bennet; Part IV. Metropolis: 7. 'The Countess of Salisbury who loved travelling' from Hatfield House to the Grand Tour: the Earl and Countess of Salisbury; 8. 'A seventh son and beau major shall gain my Lady Salisbury' courting the Countess: George Jocelyn; 9. 'Diverse great troubles and misfortunes' losing a fortune: John and Grace Bennet; 10. 'Fortune's darlings' single women in Hanoverian London: the Dowager Countess of Salisbury and Grace Bennet; Conclusion; Bibliography; Index. 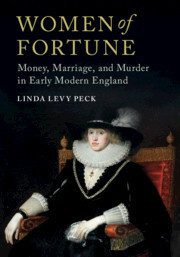 Linda Levy Peck is a prizewinning historian who has published extensively on politics, society, and culture in early modern England. She is the author of Northampton: Patronage and Policy at the Court of James I (1982), Patronage and Corruption in Early Modern England (1993), which won the John Ben Snow prize awarded by the North American Conference on British Studies, and Consuming Splendor: Society and Culture in Seventeenth-Century England (Cambridge, 2005), awarded Honorable Mention (2006) by the Sixteenth Century Conference. She also edited The Mental World of the Jacobean Court (1991). Now Professor of History Emerita at George Washington University, Washington DC, and Senior Fellow at the Institute of Historical Research, University of London, she has also served as president of the North American Conference on British Studies.